Strode through crowds and cold raindrops today, past red tulips and visibly-confused tourists to the Sackler-Freer Gallery of the Smithsonian in Washington DC to view the work of a master. As an artist in mid-life, he decided to follow no artistic overlord, but rather all creation, a principal he maintained for the rest of his 89 years. Hokusai, meaning literally, "North Studio", reflected his worship of the North Star, practiced by gazing up at the night sky or pondering the reflection of starlight in a body of water. Saw it today. I was standing at the back of a crowd. Listened to an older gentleman, who leaned heavily on a cane, explain the artistic power. The wave's fingers poised to grab the men in boats doing a simple job. 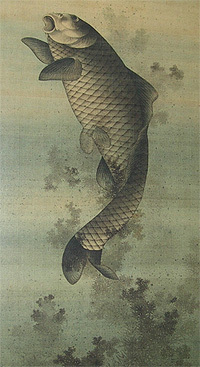 Hokusai wrote about his artistic notions. With each advancing decade, he hoped to increase his understanding of the nature of things. That his study would build his knowledge to the point of the divine, but only if he lived to be 100.
who makes a lot of noise, but means no harm. Look at the smile on his face. 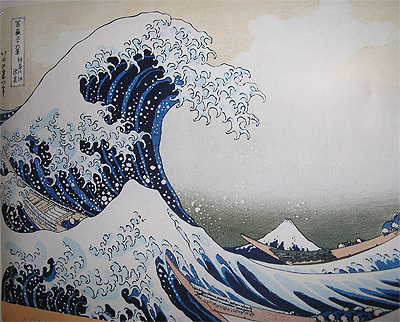 Hokusai teaches us that every brush stroke counts. If he could create art that expresses meaning, his work would continue to live. As he grew older, he produced art that conveys spiritual power, humor, and humility. He tells us age does not matter, that not all great art is created by the young. Methinks he wished to understand and express the creative power we all have, no matter what decade we inhabit. He died in 1849, still wishing for more time to become a real artist. Beautiful stuff, but could he draw Abe Lincoln like the last featured artist??? I think not!